Grown for the foliage, Aucuba are a versatile landscaping plant with a number of varieties offed by wholesale growers. 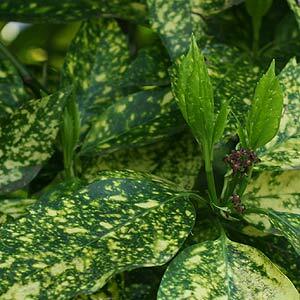 Aucuba are best known by Aucuba japonica variegata or ‘Gold Dust Plant’. Growing best in part or filtered shade in a humus rich soil Aucuba are used in landscaping to provide colour and accent to the rear or borders or as an accent plant. Also known as the ‘Japanese Laurel’ these are a remarkably easy care plant. They do grow best in light shade and moist soils, however are tolerant of dryish soils over summer as long as they have adequate protection from the hot afternoon sun. Aucuba or Gold Dust Plants can be pruned back hard if they become to leggy. Aucuba japonica picturata has bold golden centres. Aucuba japonica rozannie is a small growing variety. Landscaping uses include mass planting in shaded areas to provide a green or variegated foliage background, background plant in a part shaded border, feature plant in the border especially thr heavily variagted varieties. A. japonica Speckled green and Gold leaves. A. japonica crotonifolia – Most widely grown form with good gold and green foliage.